Above: This picture shows a very nice Anubias Lanceolata in one of our aquariums. There are several Anubias species available to aquarists, and they are all among the very best aquariums plants. Highly recommended. Origin: The ancestors of this plant lived in Africa. But this plant was grown in a famous plant greenhouse. Maximum Size: The usual maximum size for these plants is about 12" tall, but they can grow even larger if kept with good water quality and good lighting. Compatibility: Some recommended tank mates include any community fish, most Cichlids will tear up plants, and uproot them. Water Conditions: These plants like water that ranges 71.4-321.4ppm. Aquarium Size: These plants can be in any size aquarium, but for the best health of the plant, an aquarium of at least 20-gallons is best suited for this plant. Names: The scientific name for this plant is Anubias lanceolata. 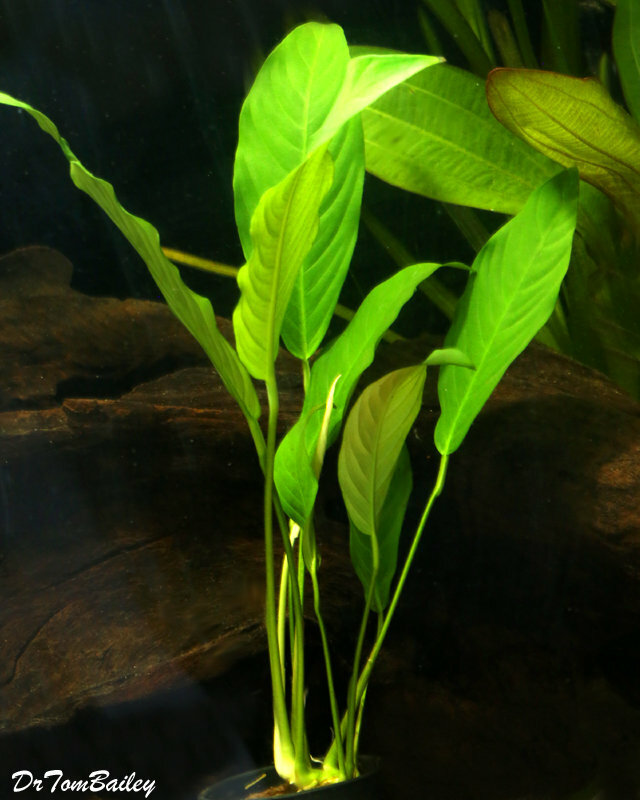 Variations: There are many variations of live plants, and there are several species of Anubias, which all seem to be very good aquarium plants.